In what’s already been a particularly cruel wildfire season for California, a series of fast-moving blazes have torched more than 65,000 acres since Monday, destroying hundreds of homes and forcing thousands to flee. Alarmingly, winds are expected to pick up in the coming days, making a bad situation potentially worse. 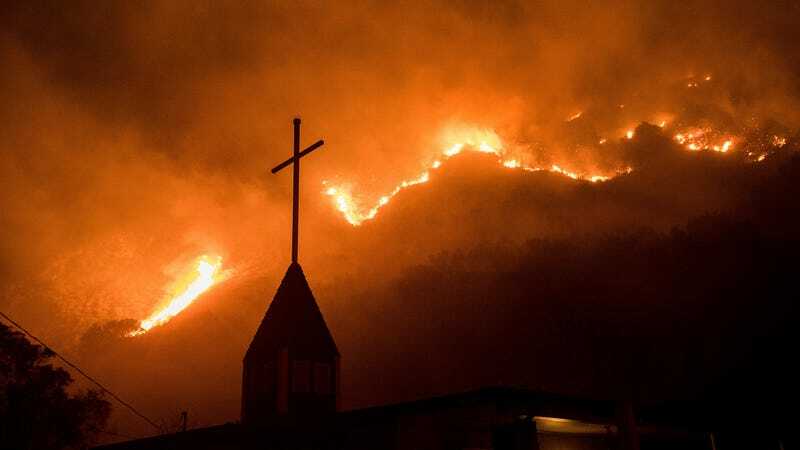 The latest California wildfire started in early Monday evening in the foothills near Thomas Aquinas College in Santa Paula, spreading quickly to more than 15 square miles in just a few hours. The fires, fueled by strong Santa Ana winds and dry conditions, are devouring vegetation that hasn’t burned in decades, according to fire officials. To date, around 10,000 people have had to flee their homes. It’s a destructive and dangerous climax to what has been a devastating wildfire season in the state. As of late yesterday, the blaze had burned over 100 square miles in areas just north of Los Angeles and east of Santa Barbara. Currently, there are five active major blazes. Some 150 structures have burned down, including the 82-bed Vista del Mar Hospital in northwestern Ventura. Officials say the number of homes damaged by the wildfires is likely much higher. The wildfire is also causing mass power outages and water disruptions. Around 43,000 homes are currently without power (with more expected), and the Casitas Municipal Water District has advised residents of the city of Ventura, Upper Ojai Valley, Casitas Springs, and Foster Park to boil their tap water for about a minute before drinking and cooking. Without power, some water pumping systems and fire hydrants are inoperable, complicating matters for fire crews. The largest of the five wildfires, the Thomas Fire, has reached and skipped across the 101 freeway just north of Ventura, burning through oil fields, and reaching the Pacific Ocean. This fire is moving extremely quickly, torching an acre per second. As of Tuesday, the Thomas Fire has spanned 50,000 acres, and is listed as “zero percent contained” by fire officials. No fatalities have been reported to date, but three firefighters in LA were hurt and taken to a hospital where they’re listed in stable condition. About 150,000 people in LA have been affected by evacuation orders for the Creek Fire near Sylmar and Lake View Terrace. Curfews have been enacted in the city of Ventura from 10:00 pm to 5:00 am. In Ventura, more than a quarter of its 100,000 residents have been told to evacuate. And it’s not over yet. After a brief respite late yesterday, the Santa Ana winds are expected to pick up today and tomorrow, gusting as fast as 35 to 50 mph, according to National Weather Service. This will likely fuel the fires even further, and possibly start new fires as it blows embers and ash elsewhere. The dry Santa Ana winds are caused by high pressure in the Great Basin and lower pressure off the coast. In the previous two years, rains have arrived prior to this stage in the wildfire season, but the region hasn’t seen any rain in the past three months. California Gov. Jerry Brown has declared state of emergency for Ventura County, and LA Mayor Eric Garcetti said “We expect to be out here all week fighting and containing this fire,” Some 1,100 personnel are currently battling the wildfires.